This outline development of a smaller weekending version of our 60′ Mystic proposal was prepared for Simon Patterson at Patterson Boatworks, a bespoke yard in Cumbria, combining traditional skills and modern technologies. 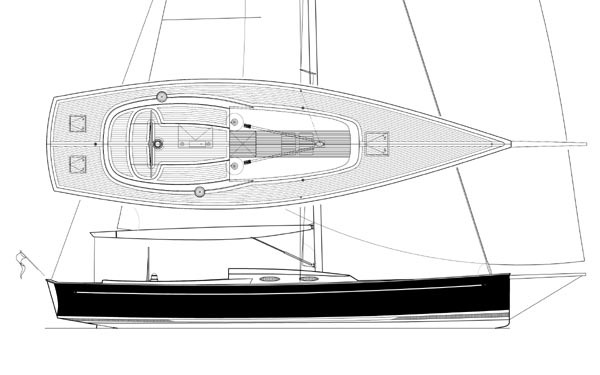 Simon felt that a light, sporty 40′ design with slightly more accommodation than a daysailer would match the desires of clients and the aspirations of his yard. The basics are a light easily driven hull, allowing a sail plan that can produce great performance but still be easy to control shorthanded. The deep fin produces low cg for stability, and excellent pace both upwind and down across a range of wind speeds. Possible arrangements have been suggested in the deck plan but this dream is waiting for the right client to decide the details. More information available from Mills Design or Patterson boatworks.